Safely dispose of unused and expired medications by bringing them to the locations below on Saturday, April 28, 2018. This is a FREE service for our community! FREE prescription drug lock boxes will be given to the first 50 people at each location - while supplies last! BRING: Prescription and over-the-counter medications, ointments, patches, non-aerosol sprays, creams, vials and pet medications. DO NOT BRING: Illegal drugs, needles/sharps, inhalers, aerosol cans, bio-hazardous materials (anything containing a bodily fluid or blood), mercury thermometers, personal care products (shampoo, soaps, lotions, sunscreens, etc. ), household hazardous waste (paint, pesticides, oil, gas). ATTENTION Columbia County youth in Grades 8-11: Join the Columbia County Youth Empowerment Group for a monthly Youth Night! This event will be held on Monday, April 23, 2018 from 6-8pm at the Lodi Sports & Recreation Center (801 N. Main St, Lodi, WI 53555). FREE pizza will be served and there is NO COST to attend. If you can join us, please email Lindsay by April 18 at patteli@lodischoolswi.org. Please share with those who may be interested! More details are on the flyer below. 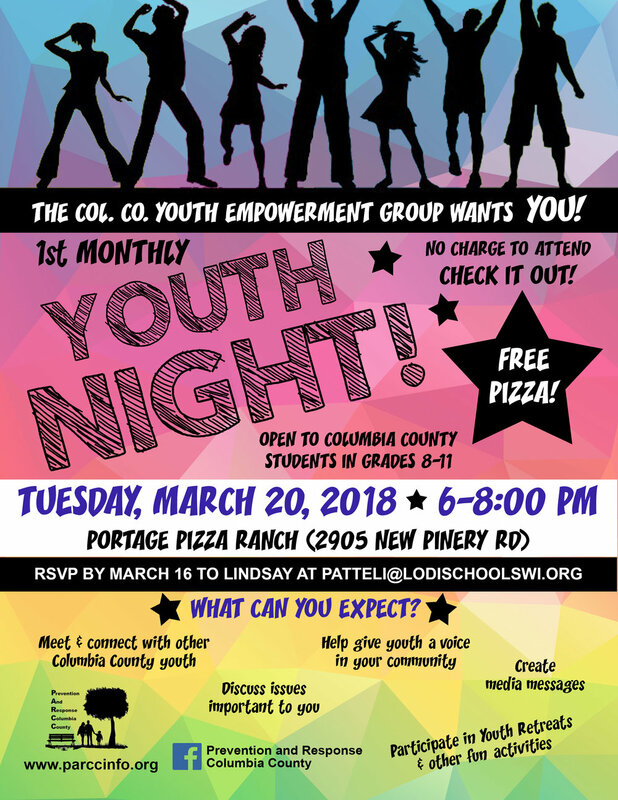 ATTENTION Columbia County youth in Grades 8-11: Join the Columbia County Youth Empowerment Group for their FIRST monthly Youth Night! This event will be held on Tuesday, March 20 from 6-8pm at the Portage Pizza Ranch (rescheduled from March 5). Free pizza will be served and there is no cost to attend. If you can join us, please email Lindsay by March 16 at patteli@lodischoolswi.org. The first PARCC Youth Night has been canceled for March 5 and rescheduled to March 20. See flyer below for details. The next PARCC meeting is Tuesday, January 23rd at 1:00 PM at the Columbus Community Hospital (1515 Park Ave, Columbus). We will meet in the Diamond Room which is on the ground floor of the hospital. We will meet as a group from 1:00 to 2:00 PM and then from 2:00 to 3:00 PM we will divide into our Prevention and Response committees. The Columbus Police Department invites you to have "Coffee with a Cop" this Wednesday, October 4th from 7-9am at the Columbus Family Restaurant. This is a national movement that aims to build trust and communication between community members and police officers, one cup of coffee at a time. Please see the flyer for more information! The Portage Police Department will be participating in National "Coffee with a Cop" on October 4th. Join them from 6:30-8:30am at the McDonald's at 2860 New Pinery. September meeting at the Columbus Fire Department. The Columbia County Sheriff’s Office & Columbia County Deputy Sheriff’s Association will host the 3rd annual K9 Golf Outing on Saturday, September 9th at the Kestrel Ridge Golf Course in Columbus, WI. The goal of the event is to raise awareness of the drug problem in Columbia County. Proceeds will go to K9 Unit to pay for Vet Bills, Future Dogs, Equipment, and Training. The golf outing is an event for everyone. Whether you’re a competitive golfer or want to putt the ball around with family and friends, we encourage everyone to get involved. Golfers will enjoy food, hole prizes, and raffles. Dust off your clubs and join in the fun! The August PARCC meeting will include a celebration of the one-year anniversary of MATRS. Guests of honor will share their program success during a lunch from 12-1pm and regular meeting business 1-2pm. Join the Columbus Police Department for National Night Out! More information coming. LCAT presents the fourth annual National Night Out with Lodi Pride! Get to know your neighbors and community members at this family-friendly event. We will have the UW Med Flight landing, a K9 demonstration and a "Hidden in Plain Sight" room display for parents to tour. Other features include local food for purchase, emergency vehicle tours and equipment demonstrations, community booths, activities, and giveaways. In addition, Prevention and Response Columbia County (PARCC) will be giving away FREE prescription drug lock boxes. Join us for the July PARCC meeting in Portage, location TBD. For questions, please contact Paula Enger at paula@lodiaction.org. Has domestic violence touched your life in some way? Do you seek connections with supportive individuals who have similar life experiences as you? If you answered "yes" to any of the above questions, then please consider attending Hope House's newest support group! All are welcome! These meetings take place the 1st and 3rd Friday's of each month from 1-2pm at Portage Public Library in the Sanderson Memorial Room (253 W. Edgewater St. in Portage). For more information, please contact Katie Fluger, Outreach Advocate, at 608-356-9123. Join us for a PARCC Meeting on Tuesday, June 27, 2017 from 2:30-4:30 pm in the Diamond Room at Columbus Hospital. Please note the time change for this event.For questions, please contact Paula Enger at paula@lodiaction.org. Hope to see you then! Join us for a PARCC Meeting on Tuesday, May 23, 2017 from 1-3:00 p.m. at the Lodi School District Office. For questions, please contact Paula Enger at paula@lodiaction.org. Hope to see you then! There will be a Prescription Drug Take Back Day event in Columbus at Fireman's Park (1049 Park Ave, Columbus) on Saturday, April 29, 2017 from 10am-2pm. Please bring your prescription medications in their original containers for proper disposal. There will be a Prescription Drug Take Back Day event in Lodi at the Lodi Police Department (142 S. Main St.) from 10:00 a.m. - NOON. Please bring your prescription medications in their original containers for proper disposal. There will be a Prescription Drug Take Back Day event in Portage at the Walgreens (2700 New Pinery Road, Portage) on Saturday, April 29, 2017 from 8am-noon. Please bring your prescription medications in their original containers for proper disposal. Parents & adults in the community are invited to learn about: 1. Drug paraphernalia that may be in your home or that your child(ren) may have access to; 2. What age alcohol and other drug experimentation may begin & what signs to watch for; 3. Current drug trends in the portage area. Join us for a PARCC Meeting on Tuesday, April 25, 2017 from 1-3:00 p.m. at the Lodi EMS Building (715 N. Main St. in Lodi, WI 53555). Agenda is TBA. For questions, please contact Paula Enger at paula@lodiaction.org. Hope to see you then!